Please note: though the building is open Easter weeekend, we will only be running a Barre class at 12:10pm with Lara on April 22nd, (Easter Monday) all other classes are cancelled that day, resuming regular schedule on Tuesday April 23rd. Thank you to all the previous members that made the transition over to Curtis Health, including picking up your new BLUE shoe tag! You will be asked to show your shoe tag as you enter the studio to attend a class and security will be making checks at various times to see that all users are wearing a tag in the fitness centre. Guests and trials are not permitted due to safety and liability, we need to know who is in the facility or class. It is important everyone has filled out a waiver. Anyone, caught bringing guests, or sharing their pass will have their membership terminated. Membership to the tenant Fitness Centre on the 4th floor of tower II, is exclusively available to tenants of the Metrotower Office complex. Memberships are $ 25.00 (including GST) per month, with a minimum commitment of three months. Membership fees will be charged to your credit card on the 1st of each month. To sign up for a membership please follow the instructions below. 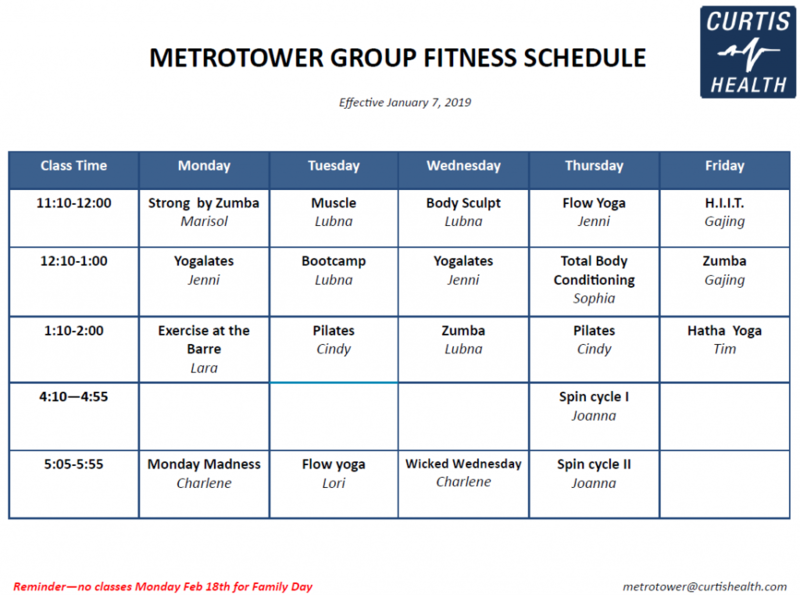 If you would like to arrange a tour of the fitness centre please call (604.437.2037) or email us (metrotower@curtishealth.com) and we would be happy to set up a time. 1. Go to https://curtiswellness.myvolo.ca/v2/Account/SignUp to set up a profile. 2. As you need an card to get to the 4th floor please contact us so we can meet you in the lobby and finish setting up your membership (bring your credit card) in the fitness centre, please email metrotower@curtishealth.com or call us at 604.437.2037. 3. The final step is to complete the, PARQ and waiver forms and email them back to us to receive your shoe tag. If you don’t have a credit card, please email or call us to arrange alternative methods to pre-pay for your membership. Your access to the Fitness Centre is from 5:00am to midnight daily, including weekends. From time to time sub instructors are necessary. Click here for a list of the known subs for this month. NEED HELP WITH YOUR WORKOUT? 1. All Curtis Health Coordinators are Personal Trainers. We are here to help you! 2. You can make an appointment for a free 20 minute fitness centre orientation to help you figure out seat settings and how to use the equipment. 3. Need more help than a quick overview? Inquire about Personal Training sessions for 30 or 60 minutes. Please contact us at metrotower@curtishealth.com or 604.437.2037 with any questions. Curtis Personalized Health Management Ltd is a fitness, health and wellness management company that assists individuals and organizations with their on-site health and fitness programming, facility design and operation. We work with individual companies to enhance the well-being of their employees and benefit the company and with Property Managers to design and operate their fitness facilities with the best service available for their tenants. Fitness Centre members will benefit from assistance with their exercise programs, tips on a variety of wellness topics and fun Fitness Challenges. We are here to help you with your health & wellness journey with Personal Training or just a friendly chat and a weight room orientation. Don’t know where to start? We will help you, no matter your fitness level, or goals. As the most established fitness and workplace wellness management service organization in the Lower Mainland, we have created and delivered healthier performance levels and happier, balanced lives through high employee participation, greater job satisfaction and increased productivity. Curtis Health has a top reputation in the industry for quality, creative programming, professionalism, stability and unparalleled service excellence. One of our core missions is to continuously offer more and exceed expectations. Over the past thirty years, we have delivered more and are driven to provide the best value for our clients. We are a team of professionals: kinesiologists, personal trainers, physiotherapists, massage therapists, fitness instructors, operations managers and human resources managers who bring the latest and most relevant industry information to our sites and our customers. Our instructors and trainers are fully certified and are trained in CPR and First Aid. Our management team is the best in the industry. We care about our team and we care about our customers. Our aim is to go above and beyond in meeting your fitness and wellness needs at every opportunity. We look forward to meeting you and assisting you on your journey to a healthy and resilient lifestyle. As Personal Training Manager for Curtis Health, Tara provides ongoing support and education to our training team to provide the highest quality training services to Curtis Health clients and members. 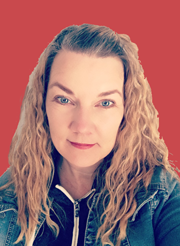 Tara has been in the fitness industry for over 15 years she is certified as a personal trainer and fitness Instructor and is a canfitpro PRO TRAINER leading courses and certifying both fitness instructors and personal trainers. Claire Hayes has worked in the fitness industry for 23 years, with 20 years dedicated exclusively to individual coaching and personal training. She has dedicated 18 years of her life to competitive bodybuilding, as a competitive athlete and also competition prep coach. Being surrounded by amazing people of all shapes and sizes with a multitude of personal fitness goals, Claire has become adept at recognizing the need for personalization and realistic program instruction. There is no “one size fits all” when it comes to one’s personal fitness. Marika is a Fitness and Health Promotion Graduate from Conestoga college. She enjoys teaching Group Fitness classes and Personal Training. 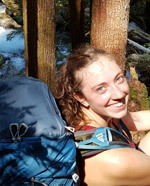 Marika loves to be outdoors; when she’s not in the gym she is either hiking, skiing, or surfing. Marika recently moved out to BC from the small town of Listowel, Ontario, where she grew up. She loves to motivate people and find their interests; exercise is so much more than just in a gym. She hopes to acquire additional certifications to teach a variety classes starting with Pilates. Everyone person is different and has a unique story, Marika works hard to get to know people and work with them to make their story a success.